Well it really did feel like summer may have finally arrived for a few days this week. I actually got to sit in the veranda when I started writing this post with the doors open - and not a cardigan in sight! Well that's not strictly true - there was one on the back of my chair - just in case, you understand. Ahem! It's all been very productive around here in a domestic sort of way, I've washed just about everything I can find that's washable (and one or two things I 'm not sure were washable now!) But anyway it's all clean! Quite a few people have asked me to write about the stories behind some of the vintage furniture on the site, as everything does have a story. To do this I have to remember to take photos of the furniture when it first arrives ! I'm not great with a camera it has to be said, anyone who has known me for even a little while will know this, but in this digital age it seems to be getting a lot easier to produce photo's that are the sort of thing that people would want to look at without screwing their faces up. So to this end I thought I would tell the story of the vintage sewing machine in the photo's attached, which sold at the week end. It has to be said that when I stood at the door and waved it off ( I made it look like I was waving good bye to the people who bought it, so as not to worry the neighbours!) it felt a bit like saying good bye to an old friend. I was four years old when we first moved to this house and the sewing machine belonged to our new next door neighbour, my Mother who had her own sewing machine - which I'm still using - would say in awe how wonderful our neighbours sewing machine was and how she liked the cabinet it was in. As I understand from my Mum it was used and serviced regularly over the years and when our neighbour died the local church held a mini sale of the things her family kindly donated and my Mum as you would expect made a bee line for the beloved sewing machine, then gave a donation that would make sure she got it, then she gave the sewing machine to me! With strict instructions to look after it and not to leave it in the sun!! This I have done for the past ten years or so, as it was quite a heavy duty machine I was able to make sofa covers and curtains and lots of heavier stuff like that, but I haven't used it for two years and as it still had the electric wiring from when it was made in 1958 it has to be said I was less keen to use it as the time went on. The truth is too that I like my Mum's sewing machine, there's something very meditative about turning the handle and working at a slower pace with the manual machine than with the electric one. But I did want our neighbours machine to go to a good home, so I put it up for sale anxiously and waited, on Sunday it sold and was collected on Monday, the lady who bought it reassured me she would give it a good home and explained that she renovates old sewing machines. Interestingly like my Mum she said she really liked the cabinet it was in. What are your vintage stories? do share. Next blog - The Vintage Desk. I'm Jacki Barnett and welcome to the Hope Cottage blog. I hope you enjoy your visit and will call back again soon. I use this space to let you know what's happening and about new pieces I'm working on. 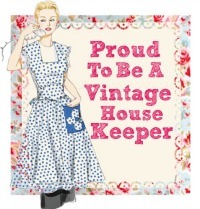 I would describe myself as a creative person, with a passion for vintage, and 'make do and mend'.